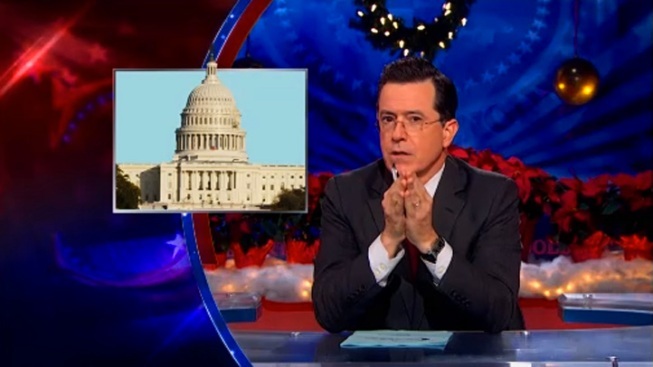 Stephen Colbert is setting his sights on Sen. Jim DeMint's Senate seat. Political satirist and South Carolina native Stephen Colbert picked up where he left off last week by pushing forward with his bid for the Senate seat opened up by Jim DeMint's retirement. "I am the clear first choice here, folks," Colbert said. "Of the possible replacements, I topped South Carolina voters wish lists with 20 percent supporting me ... that's like half." To prove his point, the Senate hopeful showed a melange of political analysts and television personalities touting their support for Colbert, with one stating he would "want to put [his] vote in for Stephen right now," and another calling the Charleston-bred host "an absolute rockstar." "So nation, do not give up on fight," Colbert stressed. The late-night host urged viewers to continue tweeting Gov. Nikki Haley on why he would make the ideal senator using the hashtag #SpottedSalamander, poking fun at Haley's April appearance on Colbert's show when she didn't know the official state amphibian. Ever the diplomat, Colbert offered Haley another way to settle the matter of the Senate seat. "You can end this by coming on my show and telling me your decision in person," Colbert reasoned. "Or we can meet somewhere more convenient. Like my Senate chambers."